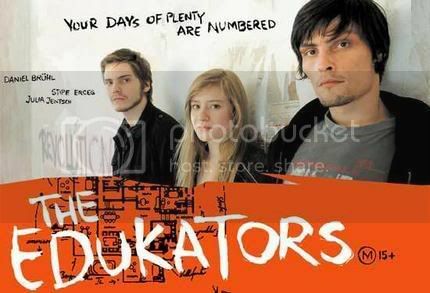 The Edukators: like it or not? Thread: The Edukators: like it or not? Have you seen The Edukators (Germany, 2004)?? From the left: Daniel Bruhl, Julia Jentsch (I think she's pretty famous in Austria), Stipe Erceg. The title didn't catch my attention at first but then I watched it a few days ago and I must confess it was interesting. Three activists misplace objects into rich estates to educate $$$ people to be more humile. I am not telling you the end if you haven't seen it. Anyway I don't have an opinion yet. It's confusing, sometimes it looks like a good movie but some speeches are really paternalistics and rethorical and look so badly fake. The English version is called Your days of plenty are numbered.